I desperately need a simple cms for one page that a client can add pdfs, text and images to. I had Kuler edits, doesn’t work anymore. Tried Sentry demo but get only a blank page after publishing. Tried Web Yep but demo download didn’t include necessary system folder it says must be on server. Quick Editor looks like a possible but offers no demo and doesn’t appear to support pdfs. HELP! On your other post, I had mentioned Easy CMS. I’m pretty sure that their text editor allows for file uploads (including PDF’s). 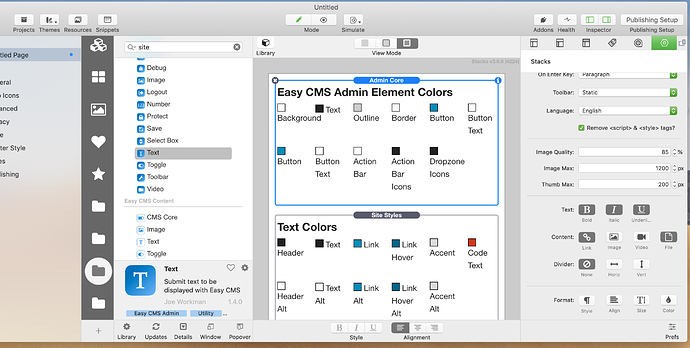 I don’t have a current/active EASY CMS demo to test but I think that is the case. I’m sure Will can get you sorted if WebYep is the preferred route but just another option to consider. Thank you so much for your reply. It sounds good but if my client can’t upload PDFs, a problem and this is for one page on one site. Hate to spend that much if I don’t have to. It does upload pdf’s (confirmed via the file upload faculty shown in the screenshot and via Joe Workman on this forum post). Otherwise, maybe they can setup a dropbox account or something similar and just link to files that they upload there. Thank you so much. That is a huge help in helping me decide the next step. And your alternative option is a good idea. Sometimes just need a boost to think out of the box a little. Are you looking to upload PDF files and save them somewhere? Or upload a PDF and display it in the text box as a file download or display the actual PDF file contents? Shame about Kuler Edits - that was a great and underrated CMS. Thanks for getting back to me. I think the client would be ok with a link. I’m pulling them away from a WordPress powered site and that’s what they were doing there. Maybe this can be used for file upload? Thank you Jannis, looking into it right now. Web Yep is a really good cms system , easy to implement too , go to stacks4stacks , Will offers the Web Yep stacks . It offers rich text and a very flexible layout. Which you create yourself. I’ve done a few with it now. There’s one little element that’s is easy to get stuck on if you miss it in the manual ref the rich text editor but just pm me on that if you get it . Try it , it answers your needs. The system - it’s all in one folder, you simply drop into sever folder where your site is. Change the rich text editor choice in the opt folder in the system. Anyway Will is much more knowledgeable about this than I. Thanks so much for your reply. I’m sure it’s that one little element that is catching me. I did try all the steps, I “believe” but will try again from scratch. It’s usally that one overlooked item that gets ya. Im splitting this into two threads which probably isn’t helping , check back to the other that’s where ill keep my replies.